Born in South Africa, Brendan migrated to Australia in the early 80's and specialises in Reggae, Calypso and African rythms. He is a professional musician, performing at many Cairns hotels and other venues. Dennis Rose is a guitarist/singer songwriter whose best known work 'Yarrabah' is often heard on ABC radio. Dennis has played many years for corporate events and now entertains at the Sheraton Mirage in Port Douglas where he sings and plays piano. His best asset is the sheer size of and variety of his repertoire. fingerpicking electroacoustic rythms... Songs to provoke thought, and grow human awareness! Drawing from her Maori heritage and 15 years experience, Emmaline's mix is contemporary soul and rhythmic roots. Her lyrics and music explore the human condition through personal stories and observations: life and death, love and loss. From soulful ballads, to upbeat reggae-fused funk, to acoustic roots, Emmaline has a long history of live performance and festival work. An acappella group which was formed last year in July to do a performance at the Peace Concert. After that performance it was decided to continue on singing. We sing mostly Afro/American Gospel Songs some in African language. The songs are very energetic, uplifting with beautiful blended harmonies. 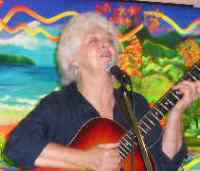 June Graham has delighted Kuranda residents and market visitors for 30 years with her songs and is an icon in the far north Queensland folk music scene. Lakota are a fusion of tribal beats and anjelique sounds. Our song resonates to the harmony of Mother Earth. Daz Hart is a percussionist who brings magic to the Hang Drum interweaving with the deeply moving vocals of Rachel Shields.Their sound is one that takes you on an unforgettable journey and brings you home to the song of yourself. From Chile, Santiago Mack Yidhaky has 10 years of experience playing and teaching Didgeridoo. Mack plays a very hard style with many animal sounds and deep energy or a Chill Out style with electronic beats, including Indian and world music. Mick has been a mainstay of the professional folk music circuit nationally and internationally over many years. His original work is well known & well respected. Mick is known as the frontman for Mangrove Jack – as well as a skilled solo entertainer. Italian born Rafeek delivers his original songs about real life situations with gusto, heart and emotion. Motivated by her belief that music is a tool through which positive change can be inspired, Saritah's songs combine lyrics that are at once global and personal, political and spiritual, with music that incorporates many influences from around the globe. Shells unforgettable voice weaves images of wild places and with her lively nature you're in for an entertaining performance! In 2005 Tobias packed his guitar and a few clothes leaving Germany to busk in Sydney... and never returned. Tobias uses a resophonic blues guitar to play his songs, which gives them a raw sound without any effects.